HJ: Your truth is uniquely you and it is your gift to the world (and yourself). In every sense, our only task in this life is to live it fully and wholeheartedly with joy and reckless abandon. But the first step on that journey is hearing the voice of your inner truth. Hearing the voice of your soul and to begin marching to the beat of that drum. Today’s article is about tuning into your inner voice — your truth — and letting it shine brightly in your life. Cultivate for yourself an open, fluid, and humble attitude. One where you simply do not know how your life will come together, or how your actions will work out, or what you will create, or how great you will become. For when we think we know, we believe we have no reason to listen, and we will not hear our inner truth. Just be grateful that you have the opportunity to act, and to create, and to do so while connected with Spirit. When we get too caught up in the future, in our dreams, in achievement, or in self-importance, we miss the beauty of what we are doing now. We are always striving for things instead of arriving in each moment of our lives, and so miss the simple power of being present in this moment, and being connected with spirit. That is how we create; I do not know of any other way that beautiful things are created, nor any other way to happiness. The greatest quality of all creators and all masters is that they listened. Not with their five senses, although they did that too, but they listened beyond their five senses. They listened for the will of the divine, and then whatever it was that will inspired in them, that is exactly what they created. Sculptures, paintings, songs, poems, masterpieces in every form of self-expression, it is all there within the field of all-possibility, and our only job is to listen for what we are already tuned to pick up – our inner truth. This is what it means to be. We do not need to act, or to achieve, we only need to listen closely within ourselves for who we already are, and live from that inner truth. Then you will naturally pick up the inspiration that you were meant to hear, and you will create things that only you could possibly create, because you are unique. And because of that all you will create will naturally be beautiful. But don’t allow yourself to be distracted into thinking that your creations are who you are, or even the dreams and positive, passionate, inspiring thoughts you discover within you. They are only emanations of your internal silence; they are illusion and your inner truth exists without form in the silence of your being. From that pure and infinite silence you will create with passion, beauty, inspiration, and bliss, and thus everything that you create will take on those same qualities: your life, your work, your relationships, your creative self-expression. Listen to your inner truth and express what comes through with trying to because the harder you try, the more that you corrupt the beauty of what you have created. Let it be raw, let everything be unfinished, and imperfect, because nothing is finished. It is always changing, and the perfection is not in a thing’s lack of flaws, but in its harmony, in its honesty, and in its movement towards completion which is an eternal progression. Create and then let go of all of your creations to make room for new ones. It doesn’t matter what it is, as soon as you have expressed it through you, let it go and move on. You will create something better as you become better. You will create something purer as you progress towards the boundless silence within you from which all creation emanates – your inner truth. You do this by listening. Listen to your internal silence. It has more secrets to tell you than all the books ever written. All of the wisest listened to this silence so thoroughly that they became this silence, and the wisdom that they left for us was their interpretation of that silence, their inner truth. Who are you? Why are you here? 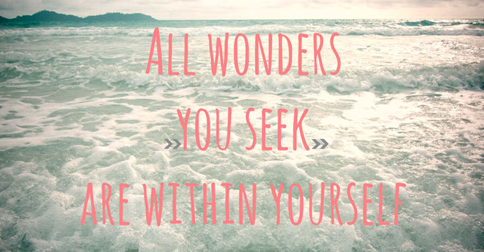 What is your inner truth? What are you naturally tuned to pick up within the field of all-possibility, and what is the truth that is entirely unique to you, which you were put on this Earth to express? Don’t tell me, show me through your beautiful co-creations.